(CNN) -- Guinea-Bissau will hold a runoff presidential election Sunday, five months after the leader of the West African nation was assassinated by a group of soldiers. 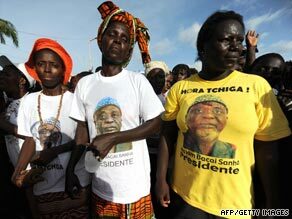 Supporters of former president and current candidate Malam Sanha rally in Bissau. The race is between two former heads of state, Kumba Yala and Malam Sanha. The candidates won the most votes in the first round of balloting June 28. Analysts hope the new president will usher in an era of stability to the nation of 1.5 million. The former Portuguese colony has had a history of military coups since its independence in 1974. President Joao Bernardo Vieira became president in 1980 after a military coup. He was accused of purging political rivals and suppressing dissent, but several coup attempts in the 1980s and early 1990s failed to unseat him. He was finally ousted in 1999 -- and re-elected in 2005. Vieira was killed in March to reportedly avenge the death of the country's military chief a day earlier. Yala, who took office in 2000, was unseated in a military coup after three years. Sanha served as interim president for a few months before his opponent's term. The conflicts have ravaged the nation's infrastructure and economy, leaving it among the poorest in the world. Guinea-Bissau has been battling a booming drug trade and is considered a major transit point for smuggling cocaine into Europe. U.N. chief Ban Ki-moon, who urged voters to be peaceful, said he hoped the election would provide a clean start. "The secretary-general hopes this election will mark a clear step forward for Guinea-Bissau in achieving political stability and security, and in fostering the social and economic conditions necessary to consolidate peace and fully realize human rights," Ban's representative said in a statement. A 1998 conflict led to the closure of the U.S. Embassy, which operates from neighboring Senegal.